Belated greetings of the new year, guys! The Iron Guy is sorry to have taken so long to post but the first few weeks of the new year are always busy. But I hope to make up for it. And I'll start right away. Actually, this is a long-term resolution for all of 2017. There are so many sports books that it would take a long time to read even a small amount of them. Besides, I've got a few other things to do soon. I've got plans for a couple of things on the blog this year. And I'm going to finish a really fun book soon and I can't wait to tell you about it. Then I've got one really, really big (and scary!) project planned for this year that will test the Iron Guy's MANLY MANLINESS to the very limits. What is it? You've got to stay tuned to find out! 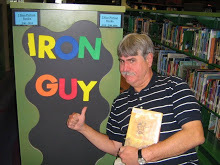 The Iron Guy--he loves books, he loves sports.